This known idol girl group derived its name from Shanghai 48, which consist of young girls from age 20 and onwards, that specializes in the Pop music genre. The concept of this group of performers is paralleled to the concept of AKB48, which was created in Japan by Yasushi Akimoto. The aim of forming this group is to perform in their own theater, garnering a massive amount of fans that they entertain and interact with. Currently, the group is owned by Ninestyle Music, Ninestyle Model Agency and Shanghai Star48, Culture and Media Co. Ltd, which are prominent companies in Shanghai. An exclusive theater was built wherein they would regularly perform. Auditions are held routinely for new members, who will be joining the in-training of the group so that in cases where a girl graduates, a new girl will have to fill in the spot as a replacement. As of November 2017, the group SNH48 has a total of 108 members who are still active, from the original number of 247 members when they first started. The original teams include the 1st to 5th generation, including the 9th generation. This is one of the subgroups for SNH48, and their team color is Light Blue, which as of August 2016 has 23 active members. This team consists of girls from the first to seventh generation, coming from different provinces in China. Their lead captain is Dai Meng from the first generation, with her co-captain, Mo Han. Most of their performances were held in the 6th stage, Xin de Lucheng, from the year 2016 to 2017; followed by 48 performances in RESET during the year 2014 to 2015. The SII group is composed of Chen GuanHui, Chen Si, Dai Meng, Jiang Yun, Kong XiaoYin, Lv Yi, Li YuQi, Liu ZengYan, Mo Han, Qian BeiTing, Qiu XinYi, Sun Rui, Shao XueCong, Wen JingJie, Wu ZheHan, Xu ChenChen, Xu JiaQi, Xu YiRen, Xu ZiXuan, Yuan DanNi, Yuan YuZhen, Zhao Ye and Zhang YuGe. Along with Team SII, this is also considered as one of the subgroups for SNH48. Presently, they have 21 active members that are selected from second to ninth generation from various provinces in China. The appointed leader of the team is Yi JiaAi, along with her co-captain, He XaioYu. A number of their performances and shows were mostly held at Theater no Megami, Boku no Taiyou, and Zhuanshu Paidu, during the timeline of the year 2013 to 2016. The following girls complete the team NII: Chen JiaYing, Chen WenYan, Feng XinDuo, Guo QianYun, Huang TingTing, Hao WanQing, He XiaoYu, Jin YingYue, Jiang ZhenYi, Li MeiQi, Liu JuZi, Liu PeiXin, Lu Ting, Ma Fan, Tao BoEr, Xie Ni, Yi JiaAi, Zhao Yue, Zhang Xi, Zhang Yi, and Zhang YuXin. Their signature Tangerine Orange as the team color, this team represents one of the subgroups for SNH48. As to date, they are composed of 24 active members that came from the second to the tenth generation. Again, all of them arriving from different parts of China. The team is headed by Wan LiNa, together with her second leader, Zhang Xin. The group frequently performs at various stages like Te Wo Tsunaganigara and Idol no Yoake starting the year 2015 up until the year 2016. The group members are Fei QinYuan, Hong PeiYun, Jiang Shan, Jiang ShuTing, Li JiaEn, Lin Nan, Lin SiYi, Li XingYu, Li YiTong, Qi YuZhu, Shen MengYao, Song YuShan, Sun ZhenNi, Wan LiNa, Wang XiYuan, Wang Yi, Xu Han, Xiong QinXian, Xu YangYuZhuo, Yang HuiTing, Yu JiaYi, Yuan YiQi, Zhang Xin, and Zeng XiaoWen. With their official team color that is light green, the members of this subgroup were picked from fourth to the seventh generation. During the year 2016 to 2017, a lot of their shows has been performed in the stage called Mengxiang de Qizhi. The leader of the team is Li Zhao, with Yang Bingyi as her co-captain. As of today, they have a total of 18 active girls that complete the team. The members of the Team X are as follows: Chen Lin, Chen YunLing, Feng XiaoFei, Lv Yi, Li Zhao, Pan YingQi,Qi Jing, Song XinRan, Sun XinWen, Wang JiaLing, Wang Shu, Wang XiaoJia, Xu ShiQi, Xie TianYi, Yang BingYi, Yang YunYu, Zhang DanSan, and Zhang JiaYu. Predominantly consisting of girls from the ninth generation, Team FT means Team Future. Currently, it consists of 19 active members, some of them coming from Team NII, Team SII and Team HII. The colors Cherry Red and Green represents this group of young girls. The names of the girls from this subgroup are: Chen Lin (Team X), Chen Pan, Li MeiQi (Team NII), Li XingYu (Team HII), Li YuQi (Team SII), Li YuQian, Liu PeiXin (Team NII), Ma Fan (Team NII), Wang XiYuan (Team HII), Wang XiYanTianTian, Wang Yi YiYi (Team HII), Xie Ni (Team NII), Xiong QinXian (Team HII), Yang LingYi, Yang MeiQi, Zhou ShiYu, Zhang Xi (Team NII), Zhu XiaoDan, and Zhang XinYue. This was an original single from AKB48, Japanese idol group version of SNH48, which was released on August of the year 2010 and is considered the first released EP of the SNH48. It was composed by talented writers like Yasushi Akimoto and Yo Yamazaki. Then, it was arranged by Yusuke Tanaka. On June 2013, it was translated to a Chinese version by Gu Rui and Gou Qing to be performed by the SNH48 group. The song is all about a declaration of love for another person and love can make a person feel with an outpour of happiness. This is the main single in one of the election MV bearing the same name. The MV is performed by the top 16 girls and was filmed in Italy with the theme of Italian Renaissance. It was released on the 10th of October 2017. The lyrics were created by Gan ShiJia, then finally composed and arranged by Frankie Cole and Glen Ballard respectively. The song depicts betrayal and deceit. In the year 2013, aside from the heavy rotation they also released Flying Get (August) and Fortune Cookie of Love (November). The following year, both the fourth and fifth EP were released namely, Heart Electric (March) and UZA (November). Furthermore, during the year 2015 they were able to launch five EP that is as follows: Give Me Five (January), After Rain (March), Manatsu no Sounds Good (May), Halloween Night (October), and New Year's Bell (December). In addition, following the successful releases of the previous EPs, they continued to produce more during the year 2016 such as Engine of Youth (March), Dream Land (May), Princess's Cloak (October), Happy Wonder World (December). Then, during the year 2017, they launched more EPs aside from the famous Dawn in Naples that made them more popular among their fans, these EPs include Each Other's Future (March), Summer Pirates (May), Sweet Festival (December). Lastly, they just release their most recent EPs namely; The Future Movement (March) and Forest Theorem (May) that is considered to be their 19th and 20th EP respectively. During the 5 years since SNH48 was formed and established, they have garnered several awards for their contribution to the Music industry. The group's first win was during the year 2013 as Most Potential Group award given at the Music Billboard new Artists Award's Ceremony. The year after that, they became the Best New Artist at the 21st Oriental Billboard Awards. Since then, they have been winning from different award giving ceremony as Best Group, Most Popular Group or Best Breakout Group. In the most recent awards, they were handed with the honor of being Outstanding Youth that was announced during the 2017 China Youth Day Gala. Aside from performance and their music, the group also pioneered the Fashion Awards. One of which, the first was held at Redtown in Central Shanghai on October 2015. In addition to this, on November 2016, they held the second Fashion Awards at the Shanghai World Expo and Exhibition Center. During the said event, the group proudly presented their very own fashion label, or most famously known as Idol's Generation. Lastly, the most recent Fashion Awards was conducted in Shanghai International Fashion Center in November 2017. The group has proven that they are well rounded and talented by releasing their first mini-movie entitled Soulvenir, which was brought to the public last January 2016. That same year in June, they announced about their Documentary film with the title Documentary of SNH48: Taking off Together. On March of 2017, a sub-unit of the group SNH48 was introduced during the ERC Chinese Top Ten Awards in China. 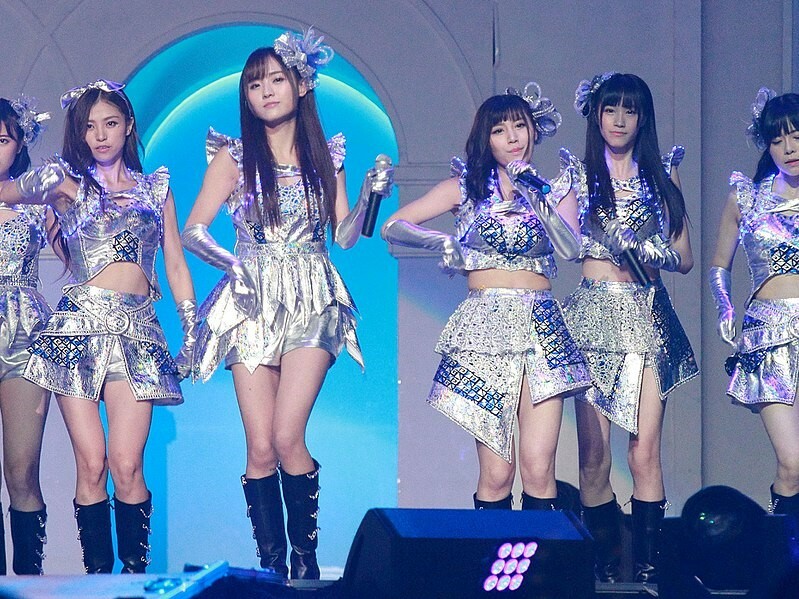 The 7senses is considered to be the first global unit for the SNH48. Contrary to the pop music performed by the pioneer group, the sub-unit showcases a different image and focuses more on hip-hop type of music. This special group was also trained by international professional trainers adopting to the Korean style idol group rather than the traditional of how the SNH48 was created. Their first ever song, Girl Crush, debuted on April of 2017. The first award that they received was during the 2nd Asia Artist award, where they won in the Best Star Award category. Along with the other two sub-unit groups, Color Girls, and ElectroEyes Girls, they kick-started their career after they were announced to the public. The group has seven active members because according to them seven represents luck and endless possibilities on the stage. The first member of the 7senses is Zhao Yue who specializes in dancing, the fans would describe her dancing skills as powerful. The singer in the group is Kong Xiaoyeen who is famous for her ballad singing as the fans would admire her clear and high pitched voice. Another singer in the group is Dai Meng who is notable for her singing of dance music and the people usually mention that she has a remarkable sense of rhythm. The group would not be complete without the Xu YangYuZhuo who adds spice to their hip-hop music with her rapping skills, she is also considered to be the only member who raps within the group. The fifth member who has a strong skill in dancing is Xu JIaqi, who is admired by the fans because of her versatility in the different styles of dance. Then, an addition to the team and is the youngest among them is Chen Lin, who also sings for the group. Lastly, there is Zhang Yuge who is not only great at dancing but is very skillful in different languages. The fans would describe her dancing as passionate and beautifully artistic. One of the members of the all-girl group, Tang Anqi, who is part of Team NII has met an accident on March 1, 2016, that eventually left her in hiatus. She has suffered from a severe burn, reports say that it is estimated at 805 of her body. Initial investigation revealed that she accidentally set herself on fire using her own lighter. However, further reports say that sit was an attempted murder by one of her fans. Miyamoto, who was a leader in her fan club, has been said to put oil on her and set the fire leading to the tragic event. Currently, Tang Anqi is undergoing multiple surgeries and skin grafts while she is on rest from performances and shows. In 2016, the SNH48 created two sister groups from Beijing (BEJ48) and Guangzhou (GNZ48). Immediately after that, they announced that they are forming the third sister group, which is SHY48 from the province of Shenyang. In the middle of the year 2017, they released the news regarding their fourth sister group from the province of Chongqing, CKG48. Also, that same year, they revealed the fifth and the latest sister group from Chengdu and will be called CGT48. This is a Thai language fan site and forum portal where issues and updates are discussed within the different fan group of SNH48. The girl group is very popular in this Thai website which is a clear indication of their fame outside of their country. They are widely idolized by young girls, women, and Otakus in many Asian countries, and some Western countries, as well.